IASB has posted its Annual School Calendar of legal dates and deadlines for 2017-2018. The calendar is published by IASB in order to assist school districts to prepare their local school calendars. Dates contained in this calendar comply with all statutory deadlines contained in the Election Code, School Code, and selected acts of the General Assembly. It does not contain dates imposed by the State Board of Education or its regulations. The school calendar is not distributed in a printed version; however, it is posted online so that it is available more quickly and allows for revisions to reflect any new legislation enacted or the correction of any errors. 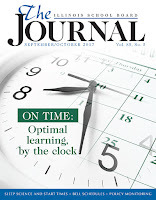 It is also important to note that the calendar is published for informational purposes only and is not a substitute for legal advice from the school district legal counsel. 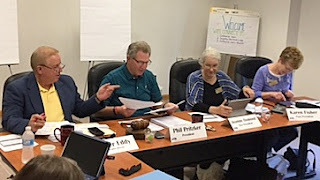 same rural Pike County lodge where IASB staff 20 years ago began discussing what eventually would become known as the Association’s “Foundational Principles of Effective Governance,” the board spent some time reviewing potential owner engagement topics. Facilitated by consultant Angie Peifer, the board considered two questions relating to Foundational Principle Two (the board connects with its community): how it can engage owners, i.e., member districts, into supporting the Association’s mission, vision, and results, and, how the board can help members to better understand and support the roles and responsibilities of an effective association governing board. The comments and suggestions from this activity will be reviewed by the board’s executive committee. The board also reviewed and approved OE policies (operations) for the executive director and the board, and the R1 indicators of compliance (results) for each Association department. The board’s purpose is to assure that the Association achieves the outcomes described in the board’s Results policies and that it operates according to the values expressed in the Board’s Operational Expectations policies. In other business, Treasurer Tom Neeley presented the financial report and results of the annual audit. Neeley said the Association will solicit bids for next year’s auditor. Co-chairs Carla Joiner-Herrod and Mark Christ gave the board an update on the 2017 Joint Annual Conference. The board of directors will meet twice during conference, on Thursday, Nov. 16, and on Sunday, Nov. 19, when it will review how this year’s Conference went. Co-chairs of the executive search ad hoc committee, Karen Fisher and Sue McCance, gave a brief update on the search to replace retiring Executive Director Roger Eddy. The committee is accepting applications until Sep. 15. Vice president Joanne Osmond gave a resolutions report, which will be compiled and sent to Association membership prior to the Delegate Assembly. Deputy Executive Director Ben Schwarm updated the board on the developments in Springfield relating to the state budget and school aid funding formula. Both Schwarm and Eddy indicated that the situation is very fluid, with likely compromises on sensitive issues such as corporate replacement tax and vouchers. 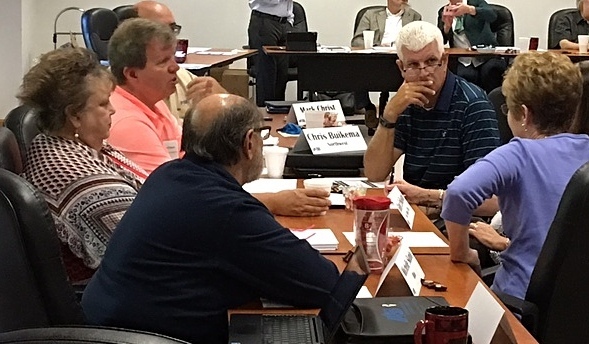 Board leadership gave a report from the recent NSBA summer leadership seminar and Eddy discussed the recent executive directors’ institute. 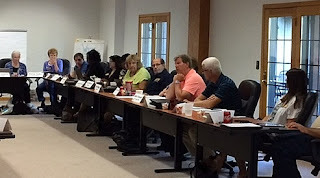 Eddy also updated the board on staffing and membership. The board also approved two firms for membership in IASB Service Associates: Nels Johnson Tree Service of Evanston, and Meemic of Auburn Hills, Michigan. Today, the Illinois Senate approved SB 1947, the school funding reform bill. Governor Bruce Rauner has vowed to quickly sign the bill into law, thus ending a long stalemate between the partisan caucuses and the two legislative chambers. The bill, which passed the Senate on a vote of 38-13-4, will be effective immediately upon the governor’s signature. Both the Illinois State Board of Education and the Office of the Illinois Comptroller have pledged to process the necessary paper work as soon as possible so funds can begin flowing to Illinois’ public schools. General funds for schools have been held up so far this fiscal year because no evidence-based funding program had been put in place in accordance with language in the budget bill that only allows a distribution of most funds under an evidence-based funding program. SB 1947 contains most elements of the evidence-based model supported by Vision 20/20 and the School Management Alliance. More information on the compromise funding language can be found in the last Alliance Legislative Report. The approval of a new, more equitable school funding formula, however, was not all good news. Yes, funds can now begin flowing to local public school districts. Yes, using an evidence-based model will direct scarce state funds to those school districts in the most need. But the essence of legislative compromise means that not everyone is happy with the result. Unfortunately, after all of the hard work contributed by school business officials, superintendents, principals, and school board members in the funding discussions, the Alliance could not support the final language in SB 1947. 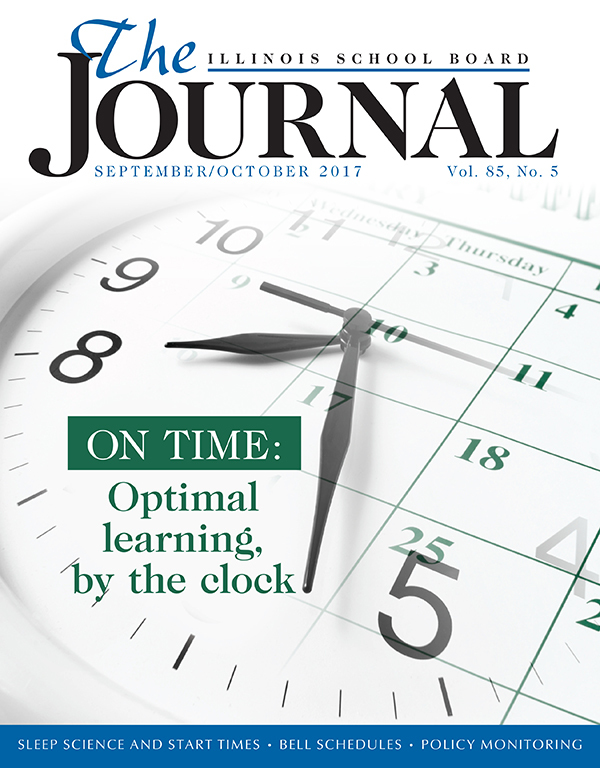 The inclusion of provisions to allow taxpayer-initiated referenda in school districts that are calculated to be at least at 110 percent of their adequacy target was opposed by the Alliance. Currently, there are numerous tools on the books for transparency, taxpayer/citizen input, and participation in the property taxation process. An annual budget hearing by the school board regarding the adoption of a budget, the Truth in Taxation Act, and, ultimately, an election every two years where school board members face the greatest accountability are components of current statute. Also opposed by the Alliance were the provisions creating a new income tax credit for taxpayers who contribute money for the purpose of covering non-public school tuition. The tax credit, generally a private school voucher program, creates an immediate diversion of public resources for the purpose of funding private education. The most striking element that became evident over the past few months was the passion, resilience, and dedication of school superintendents, principals, business officials, and board members. Through all of the acrimony, political wrangling, and dire circumstances for local schools, they consistently took action with the best interests of the students of our public schools in mind. The School Management Alliance is opposed to the plan for a statewide income tax credit program for the amount paid to a non-public school for tuition. The $75 million proposal is nothing more than a private school voucher program that would divert millions of public dollars to non-public schools. Each of the organizations that comprise the Alliance have had long-standing position statements that call for opposing voucher and tax credit schemes. School board members and administrators are urged to contact their legislators today and ask that they reject the tax credit/voucher plan. The Illinois House of Representatives is meeting in session later this morning, but at this time there has been no bill or amendment filed carrying the tax credit language. For that matter, there still has been no legislation filed on the rest of the school funding compromise, though leaders say that there will be a vote today. Time is running out for taking action on an override motion on the veto of SB 1. It is still unclear on whether the plan is to override the governor’s action on SB 1, then pass trailing legislation to make the other changes the legislative leaders agreed to, or to scrap SB 1 and re-write the evidence-based funding model language into other bills. Watch for updates throughout the day on the legislative session. IASB added another school district to its membership rolls on Aug. 16, with the addition of Ohio CCSD 17. The district is located in the Starved Rock Division where Laura Martinez is field services director. Membership totals include 844 member districts. With only six non-member districts, 99.3 percent of Illinois school districts are now members of the Illinois Association of School Boards. IASB’s Online Learning Center continues to offer the state-mandated Open Meetings Act (OMA) training as required for new school board members within 90 days of taking the oath of office. Click here for more information and to register. Attend a Pre-Conference Workshop at the 2017 Joint Annual Conference in Chicago on Friday, Nov. 17. 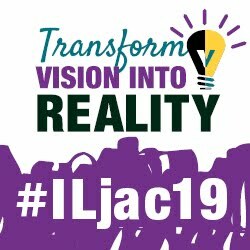 Click here for more information, and contact your district office to ask them to register you for Pre-Conference Workshops. For more information on meeting these state training mandates, click here. Patrick Rice, director of field services for IASB, has authored a new book, The Essential Quick Flip Reference Guide for School Board Members. The book is designed to provide fast access to essential information school board members need to know to govern effectively, according to Rice, a former teacher and school administrator. The book, spiral bound and small enough for convenient portable reference, provides information on a range of topics, including board member expectations and duties, school board governance, parliamentary procedure, school community relations, and more. The guide, Rice’s second published work, is available from IASB’s online bookstore for $12.99, at: www.iasb.com. 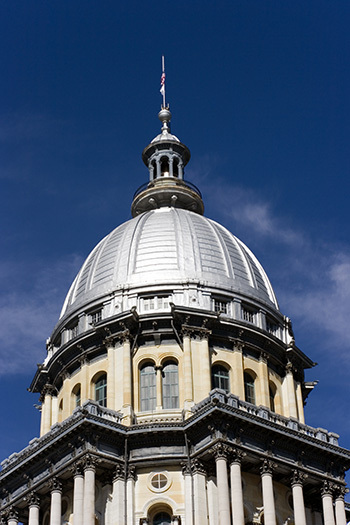 The legislative leaders of the Illinois General Assembly announced yesterday (Thursday) that they have come to an agreement in concept on a compromise to the school funding stalemate. Discussions will continue today and through the weekend, with the House of Representatives coming back to the Capitol on Sunday afternoon for a legislative session. Reportedly, drafting of the new legislation is underway. Details are sketchy as those in the negotiating room have been tight-lipped and there is no legislation officially filed. But the expectations are an evidence-based funding model with most of the components mirroring SB 1; some modifications in reference to the governor’s amendatory veto revisions; mandate relief for public schools; and some version of an income tax credit for amounts paid to non-public school for tuition. It is unclear as to the procedural path that this compromise language will take. SB 1 could be allowed to die with all of the new language added to different bills already in a posture for passage. Or, the House could vote to override the governor’s action on SB 1, thus enacting that bill into law, then approve subsequent legislation that would make the changes needed to SB 1 that correspond with the new agreement. Apparently, the initial action on the funding reform plans will begin in the House. Once the House takes action (possibly Sunday; more likely Monday), any new legislation would need approval from the Senate. The Senate has not indicated when it plans to return to Springfield. No general funds have flowed to schools this fiscal year because of the lack of agreement on an evidence-based funding model. School districts should have received their second general aid payment by now. Once legislation is approved and enacted into law, the State Board of Education and Office of the Comptroller processes of vouchering and issuing payment should take seven to 10 days. IASB’s 2017 Fall Division Dinner Meetings are set to begin Sep. 26, with a gathering of the Illini Division taking place in Mahomet. The final meeting of the season is scheduled for Nov. 1, when the South Cook Division will meet in Hickory Hills. In between, the Association’s 19 other divisions will meet in venues across the state. Each division dinner meeting offers networking opportunities and updates from Association staff and division directors and chairpersons. 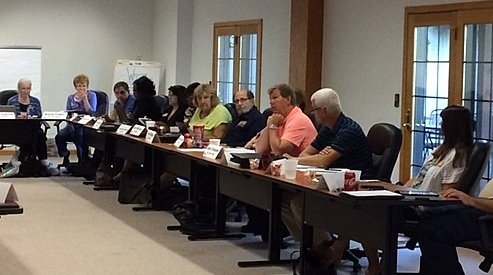 Attendance at division dinner meetings also earns participants five points in IASB’s Master Board Member Program. Most meetings also offer keynote or breakout panel sessions on a variety of important education topics for school leaders. Online registration and payment is required; however, district superintendents or secretaries should first update their district roster in the IASB member database so that the names of individuals who are attending can be included in the registration. The Illinois House of Representatives convened in session today (Wednesday) but took no action on the amendatory veto of SB 1. Governor Bruce Rauner issued his amendatory veto earlier this month and the Senate voted to override the governor’s action Sunday (Aug. 13). When the House first scheduled Wednesday’s session, most observers assumed the intent was to attempt the veto override. But it became evident earlier in the week that such action was not going to be on the agenda for the single day session. Instead, the House held a committee hearing on House Amendment #4 to SB 1947 which contains language that is identical to the governor’s amendatory veto revisions. The amendment was sponsored by House Democrats, all of whom oppose the governor’s proposals. Republicans cried foul saying that this amendment was not a serious attempt at addressing the school funding impasse, but was political in nature. Several school superintendents were on hand to testify before the appropriations committee. The often emotional hearing contained heated exchanges between witnesses and legislators. The passionate debate continued onto the House floor when SB 1947 was considered. The amendment was defeated with zero “yes” votes, 60 “no” votes, 33 “present” votes, and with 25 House members not voting. Negotiations to reach compromise on an evidence-based school funding formula will continue, but instead of the bipartisan group of legislators who have been meeting, the legislative leaders will meet on Friday. The result could be a House override of the governor’s actions, thereby restoring SB 1 to the version that was originally approved by the House and Senate in May – then approving subsequent legislation (a “trailer bill”) that contains education provisions favored by Republicans. One component could be a statewide private school voucher program that the governor has recently pushed. House members must take action on the amendatory veto of SB 1 within 15 days of when it was officially read into the record in the House. It was read into the record on Monday, Aug. 14. The Alliance is opposed to any voucher, scholarship, or tax credit designed to redirect state funds from public schools to non-public schools. Both the Senate and the House are now out of session and will return at the call of the president and speaker. House Speaker Michael Madigan indicated that House members will return next Wednesday, Aug. 23rd.